JAXA confirmed completion of the commissioning phase of ARASE, formerly known as ERG, Exploration of energization and Radiation in Geospace. ARASE has entered its science operations phase. The call was made as the following procedure took place as scheduled and was confirmed; the satellite post launch orbital systems are in place, their functions are determined as fine, all monitoring instruments are installed, and the motions of the monitoring equipment are checked. ARASE is in good condition, with all its onboard apparatus for science observations performing well since activated. Arase critical operation phase successfully completed! JAXA confirmed completion of the critical operations phase of Arase (ERG), Exploration of energization and Radiation in Geospace. It results from a sequence of significant tasks that occurred as anticipated: perigee up maneuvers and extension of its wire antennae and masts. On October 20, "ERG", the Exploration of energization and Radiation in Geospace was shown to the media in the Uchinoura Space Center, Kimotsuki-cho, Kimotsuki-gun, Kagoshima. In the Telemeter Center on the premises, Project Manager Iku Shinohara and Project Scientist Yoshizumi Miyoshi addressed the general facts of "ERG" and the scientific contributions that "ERG" is expected to make. Enhanced Epsilon will carry "ERG" on board. Preparation for launch is underway. On September 29 (Thu. ), the Exploration of energization and Radiation in Geospace "ERG" made its appearance to the press at the Sagamihara Campus. The ERG satellite carries nine cutting-edge instruments as well as hope of many to discover the mystery of the Van Allen belts. 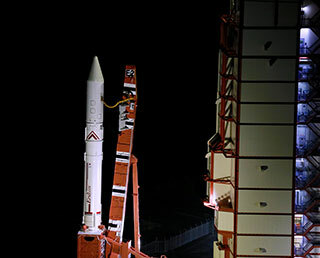 The geo probe is scheduled to be launched by the Epsilon launch vehicle from Uchinoura Space Center in JFY2016. Let Geospace satellite “ERG” carry your support message! We are inviting you to have your message travel on the ERG satellite to explore the Van Allen belts, which is the last frontier in space around the Earth. Please send your support message to the mission of the “Exploration of energization and Radiation in Geospace” or “ERG”, which is scheduled to be launched in JFY2016. The messages will be printed on an aluminum plate that will be installed on the satellite as part of a balance weight.